Even in the UK, storm damage can pose a serious threat to properties. As any property developer should know, insuring against damage to the buildings in your portfolio is incredibly important. The last thing that anybody needs is to have to pay extravagant repair costs as a result of high winds or flooding. Below is a short guide to ensuring that you and your properties are prepared in case of severe weather. In addition to performing inspections and general maintenance, property management companies provide financial services too. This includes organising building insurance and making sure that clients are covered for every eventuality. Rely on pages like this review of Hamilton King to learn more about the company that you are about entrust your properties to. For true peace of mind, choose a reliable property management firm that can protect your assets. 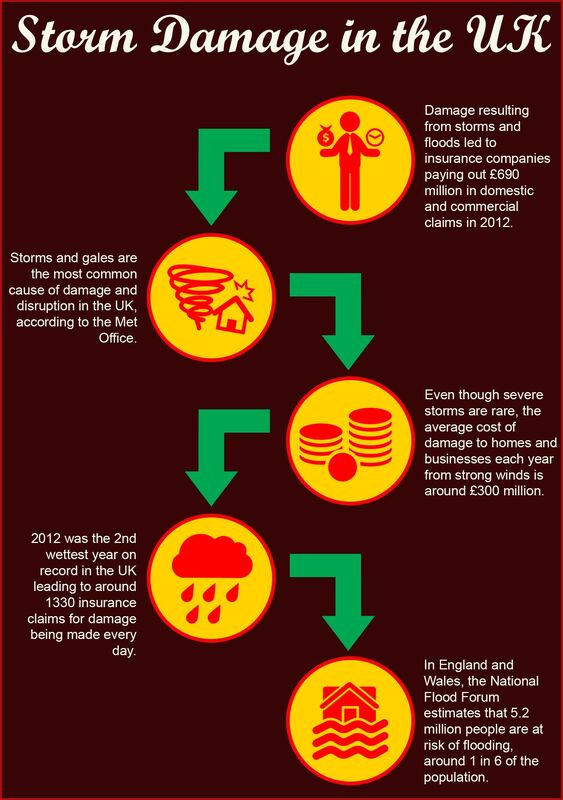 In 2012, the wettest recorded year for England and Wales as many as 1300 customers a day claimed for storm damage from their insurers. All told, the amount that UK insurers paid out that year was as high as £1.19 billion, so make sure that you are amongst those able to make a claim by getting comprehensive buildings cover. The weather might have been particularly harsh three years ago, but insurers are always expecting the next big storm to hit and are prepared to help millions of customers across the country recover and start rebuilding their homes and businesses. As a landlord, be prepared for the next time a big weather front moves in. Getting building cover from an insurer is a straightforward process, and most policies automatically cover damage to the property as a result of storms, however a common sticking point between insurers and their clients is reaching a common definition of what a storm might be. Typically, a storm is considered a storm for insurance purposes when it exceeds a certain high value on the Beaufort Scale, which assigns wind speeds a value between 0 and 12, with 12 being assigned to the strongest gale force winds. When making a claim for storm damage, you will soon discover that wind speed is critical to determining whether the claim qualifies. If your property has been damaged during a storm but your insurer deems the wind speed to be too low, no matter what caused the damage. Go over your policy thoroughly beforehand to see how severe the wind speed has to be before making a claim, or speak with your insurer directly to clear up any grey areas. Another factor to take into consideration when making a claim for storm damage with your insurer is the state of the building before the storm happened. As a landlord, property maintenance is of the utmost importance regardless but most policies state that the building should be in good shape. If the insurance company inspects your property and deems that it was in a state of disrepair before the storm hit then you can almost guarantee that your claim will fall through. Should your property be deemed to be in disrepair before receiving damage from a storm, then it is more likely that you can only claim for part of the damage. For instance, if the roof is blown off and water reaches the rooms below then you can only claim for damage to the roof. As far as the insurance company is concerned, the damage to the rest of the house would not have happened if the roof was there in the first place. At this point it might seem almost impossible to actually claim for storm damage from your insurer. However, the financial ombudsman regularly takes cases on whereby a claim has been denied because the wind speed was too low or that the damage would not have been as severe if the property was better maintained. The ombudsman will take into consideration a number of factors including the state of the building beforehand but also any previous cases of storm damage and decide if the damage is in any way similar. While the ombudsman cannot overrule the decision of every storm damage claim, you can rest assured that there are ways of successfully claiming against Mother Nature. From the evidence presented above, it is clear that there are two ways to help protect your assets from the damaging effects of severe weather. Make sure that your buildings insurance protects against storm damage is the first step you can take. Secondly, regular maintenance is not only going to help prevent the damage in the first place, but will certainly help your claim by preventing insurers from using this loophole.